On a sultry Thursday, the students left the SIAS hotel, where they had been staying for the past ten days, and embarked on their weekend trip to Jiyuan, Jing’s hometown. Immediately after their arrival, the students visited the Jiyuan First High School where they were first welcomed by the head master of the school and then the friendly, enthusiastic students. To experience the local students’ lives more closely, the NMH students attended an English class alongside them. Our NMH students were surprised that, in a typical Chinese high school like the Jiyuan First High School, seventy students share one classroom. After the English class, our NMH students enjoyed a talent show presented by the Jiyuan students. Later a basketball game was played between the local students and the NMH students to further strengthen their newly built friendship. On Friday morning, the students were invited by Jing to her parents’ home in Jiyuan. Jing’s mother ardently welcomed our students with her kindness and delicious fruit! Later the students went to a kindergarten and spent a wonderful time playing Duck Duck Goose with the adorable kids. In addition, our students learned how to make steamed buns. In the afternoon, the students visited a local middle school where they individually attended two classes with the local students. After the classes, all the students went to the school’s auditorium for a talent show in which the NMH students also gave several impromptu performances in return for the hospitality they received. Later our NMH students went home with their host families. 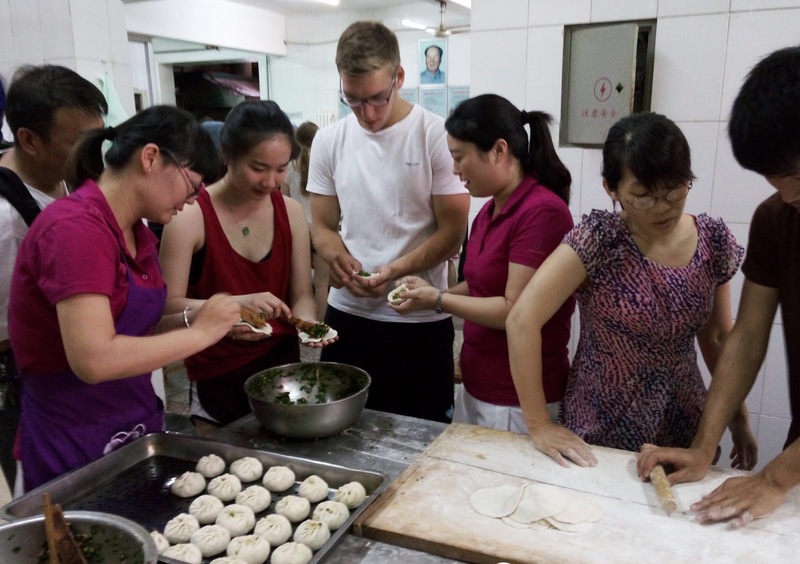 Living with a traditional Chinese family is a refreshing experience for them; they made dumplings and ate local dishes prepared by their families. At the end of their home-stay, many of our NMH students felt that they had never spoken that much Chinese in one night in their lives! Patterson Malcolm: “The past few days have been the most important in the development of my Chinese communication skills. Being forced out of my comfort zone and required to utilize a language not native to me has improved every aspect of my Chinese. By meeting high school students I was exposed to a glimpse of my own life in another culture. This idea of a parallel culture version of my self was expanded by the opportunity to live with a family on a one night home stay. This relation to my own life will drive me to make further connections with the Chinese people through the study of their language." On Saturday morning, the students said goodbye to their host families and, after exchanging e-mail addresses, the students started heading to their next destination, Xiaogoubei Scenic Spot. Leaving their city life behind, the students were absorbed by the nature and its endless greenness. On Sunday morning, the students left for the Wulongkou Scenic Area, a mountain with several thousand monkeys, where they found macaques all over the place. After their visit to the Wulongkou Scenic Area, the students took a three-hour bus ride back to SIAS campus. Despite a day of traveling and moving, most students went to the classroom during study hall hours to prepare for the upcoming final on Thursday. On Friday, the students will end their three-week study at SIAS and leave for Nanjing.